Following on the success of the Rethink Child Care campaign, CUPE will be launching an exciting new campaign, Child care for all. We all have stories about the struggle to find and afford quality child care for ourselves, our family, or our friends. Through this campaign, we tell our stories to keep political pressure on our governments for affordable child care. The Child care for all campaign will support members to use their own stories to advocate for political action on child care. Political action workshops will be held to teach CUPE members how to tell their child care stories to persuade and motivate others. Afterward, members will be supported to take action for child care with other advocates in their communities. Join the campaign! Sign up here. Affordable child care is far from a reality for most parents and children throughout Canada. At $1,321 per month in Vancouver and $1,649 per month in Toronto, median child care fees in many Canadian cities are off the chart. A study for the City of Toronto found that licensed child care was unaffordable for 75 per cent of families. These fees are not decreasing—toddler fees rose by 8 per cent in Canada’s largest cities between 2014-2016 despite an inflation rate of 2.5 per cent. Child care is not accessible unless it’s affordable. Families need affordable child care now. The child care workforce is key to quality child care. Right now, child care workers, many of whom are CUPE members, have poor wages, benefits and working conditions. Across the country, 25 per cent of all program staff earned below $14.00 per hour, with median wages for program staff at $16.50 in 2012. That’s why decent work and wages for child care workers needs to be the foundation of any child care system. The research is clear: Public and non-profit child care consistently receives higher quality ratings than for-profit centres. 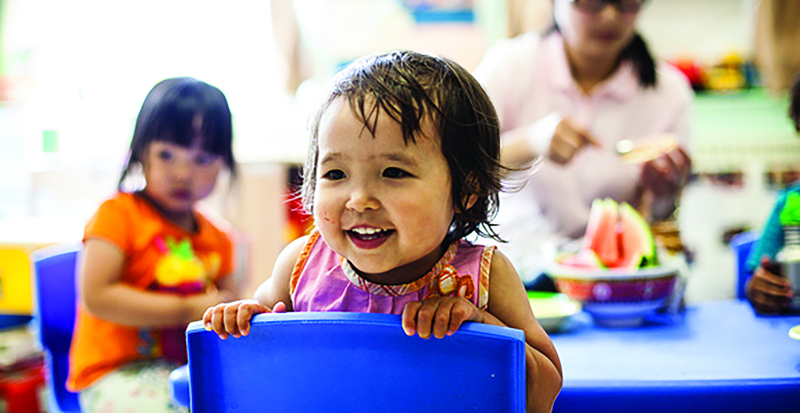 Big-box child care centres have been gaining a significant foothold with 30 per cent of Canada-wide centre spaces in 2012. When corporations dominate, parent fees soar and governments make hefty payouts to support shareholders’ profits. We need to ensure future child care investments are made in public and non-profit child care in Canada. Find out more at cupe.ca/child-care. David Macdonald and Martha Friendly, “A Growing Concern: 2016 Child Care Fees in Canada’s Big Cities” (Canadian Centre for Policy Alternatives, December 2016), https://www.policyalternatives.ca/sites/default/files/uploads/publicatio…. Gordon Cleveland et al., “City of Toronto Licensed Child Care Demand and Affordability Study” (City of Toronto, October 2016), https://www1.toronto.ca/City%20Of%20Toronto/Children%27s%20Services/File…. “You Bet We Still Care: A Survey of Centre-Based Early Childhood Education and Care in Canada” (Child Care Human Resources Sector Council, n.d.). Carolyn Ferns and Martha Friendly, “The State of Early Childhood Education and Care in Canada 2012,” Moving Child Care Forward, June 2014, http://childcarecanada.org/sites/default/files/StateofECEC2012.pdf.